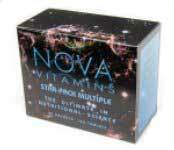 Nova’s multiple formulas lead the field in multiple supplementation. Utilizing the highest quality raw materials, formulation based on the most current scientific knowledge, advanced production technology and diligent quality control, these products deliver a complete nutrient profile, carefully balanced with respect to human requirements, in a highly utilizable form. Nowhere in the formulations is expense ever considered over nutritional value. With Nova, “the ultimate in nutritional science” is more than a phrase, it is a commitment. Sustained release nutrition. Advanced tableting technology allows for a gradual release of the water soluable C and B-complex vitamins. These nutrients, which are not readily stored in the body, are released from tablet over a six to eight hour period promoting tissue saturation and minimal waste. Beta-carotene. Known as provitamin A, the yellow plant pigment beta-carotene is converted to true vitamin A by the liver. Beta-carotene is preferable to performed vitamin A in two regards: 1) unlike preformed vitamin A, beta-carotene cannot accumulate to toxic levels; and 2) published research in the New England Journal of Medicine validates the anti-carcinogenic properties processed by this nutrient, identifying it as one of several dietary factors important in the prevention of cancer. Mineral chelates. 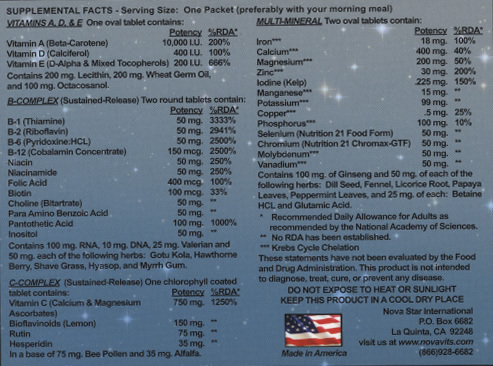 There are several forms of supplementary minerals on the market but none better than those used in the Nova multiples. High bioavailability of Nova minerals is made possible by a patented chelation process using hydrolyzed vegetable protein as a carrier. The mineral profile in both of Nova’s multiples contains virtually every trace element known to be essential in human nutrition. Quantities are carefully balances to ensure proper utilization of all the elements, especially those that compete with each other for uptake. Selenium, the essential antioxidant nutrient, is obtained from Nutrition 21 sources for all the Nova multiples. Natural source vitamin E. Natural vitamin E has significantly more biological activity than synthetic preparations and is, in addition, absorbed far more readily. Nova’s pure d-alpha tocopherol is derived from fresh soybean oil and has a high antioxidant characteristic which enables it to protect the body better than the synthetic forms. Complete B-complex. Containing generous quantities of all the essential components of the vitamin B-complex, the Nova Multiples also include the B-complex factors inositol, choline and para-aminobenzoic acid. Vitamin B-3 is provided as a balance on niacin and niacinamide to obtain the nutrient’s cardiovascular benefits without producing the discomfort of a “niacin flush”, experienced with larger does of them. Mineral ascorbates. Many prominent health practitioners recommend large dosages of vitamin C, but that can result in a strong acid reaction. To circumvent this problem, Nova uses the gentle pH-buffered form of vitamin C known as mineral ascorbates. Calcium and magnesium ascorbates are easily tolerated in the gastrointestinal tract and have the additional benefit of replenishing minerals lost through vitamins C’s slight diuretic effect. Herbs, nucleic acids, enzymes and superfoods. Nova’s multiples are formulated with dietary factors known to impart a beneficial effect on the health of the user. One of these, the nucleic acids, (RNA and DNA), supply nucleotides that are used as building blocks for the body’s own nucleic acids and as cofactors in every energy-producing reaction in human physiology. The herbal complex supports the digestion and utilization of all nutrients in specific organs and tissues while the potent superfoods, bee pollen and alfalfa supply free amino acids, enzymes, chlorophyll and trace elements. In addition, enzyme-rich barleygrass, alfalfa, watercress, and rice bran supply trace elements and large quantities of health-building chlorophyll. The information, resources and links on the website are provided for informational purposes only. Nova Star International and its staff assume no responsibility for its accuracy, and the information is subject to change without notice. Any use of, or actions taken, based upon any of the information contained on or accessed through this listing is done entirely at your own risk and is your constitutional right. Mention of various products or services is for informational purposes only and constitutes neither an endorsement nor a recommendation. When using products off this website without a consultation, NSI and its staff assume no responsibility with regard to the selection, performance, or use of these products.